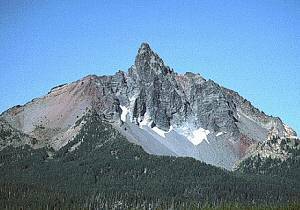 Searchers on Saturday found bodies of two Washington state climbers on Mt. Washington, still roped together after 150-foot fall. July 31 - Two “very experienced” climbers from Washington state fell about 150 feet to their deaths on the slopes of Mount Washington after their climbing safety gear apparently failed, Linn County Sheriff Dave Burright said Saturday after searchers found and a National Guard helicopter removed the two men’s bodies. The two men, identified as Thomas A. Seifert, 46, of Goldendale and Gary L Gentz, 50, of White Salmon, had set out Thursday for what was supposed to be a one-day climb of the 7,794-foot peak, which sits on the Linn-Deschutes County line, not far south of the Jefferson County border. When the pair didn’t return home as scheduled, family members contacted Deschutes county sheriff’s officers, who eventually found their vehicle, parked at the Pageant Lake trailhead, near Big Lake, Burright said. Linn County authorities were advised, and a search organized, the sheriff said. Organizations involved included the Linn County Search and Rescue Post, the Jefferson County Sheriff’s Search and Rescue Unit, and mountain rescue groups from Eugene and Corvallis. They were joined Saturday morning by a Blackhawk “medevac” helicopter from the 1042nd Oregon Army National Guard Unit, based in Salem. Around 11 a.m. Saturday, the two men’s bodies were found by a Jefferson County team on the west side of the mountain, at the 7,190-foot level, Burright said. “They were still roped together, and had fallen about 150 feet, after their climbing safety equipment had apparently failed,” the sheriff said. The National Guard crew airlifted the bodies off the peak, and they were taken to a funeral home in Sweet Home, pending arrangements to be returned to Washington state, the sheriff said. I have contacted the Linn County and Jefferson County Sheriff's Search and Rescue units. I have interviewed the Incident Commander and the On Scene Commander. I have requested a copy of the final report. I believe there is much that can be learned form this tragic accident and I will make the public facts available in due course. Read my Report to the American Alpine Club.